LiveCode LessonsLiveCode LessonsHow To - LiveCode Mobile Tasks LiveCode Mobile TasksHow do I detect a shaking motion using LiveCode mobile? This lesson will show you how to start using the 'motion' features provided by the accelerometer on an iOS or Android device. Specifically we will look at how you might make your application perform a certain action when the device is given a good shake. 4) Set its name to "messages"
We have added two now messages that allow your stacks to be notified when a 'motion' on the device starts and when one stops. Place these two handlers on the card or stack script of your stack. Lets start by making sure that we are getting the messages we expect. put empty into field "messages"
put "motion start:" && pMotion into line 1 of field "messages"
put "motion end:" && pMotion into line 2 of field "messages"
The Android simulator does not provide a feature allowing you to test shake motions. 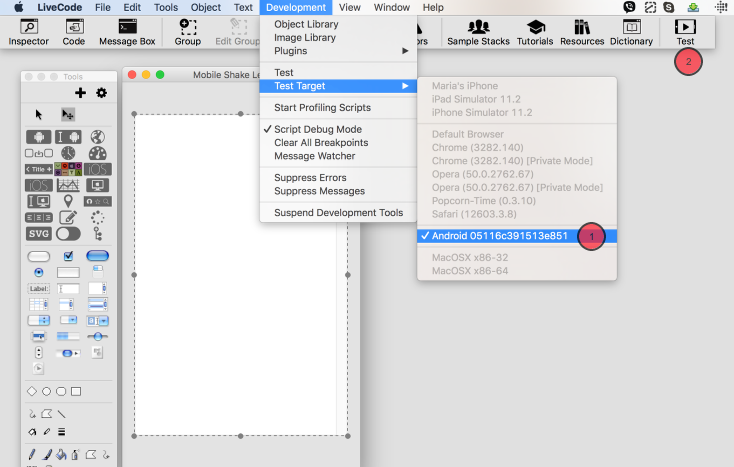 To test on Android you will need to test directly on a device, of course the device must have an accelerometer. And that you have set up LiveCode for Android depolyment. The application is deployed to your device and is ready to be tested. For iOS devices simply click on the Simulate button in the menuBar. 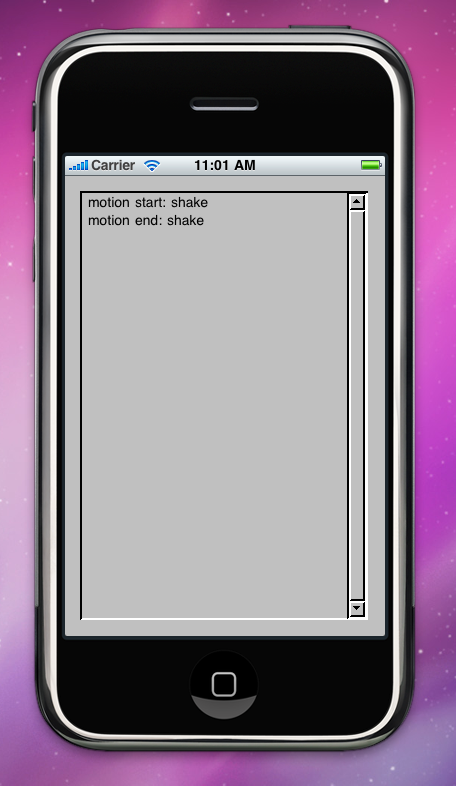 Once the simulator has loaded select Shake Gesture from the simulator's Hardware menu. So we are getting start and end motion messages. Lets expand out to time how long the user shakes their phone for. put "Shake Started" into line 1 of field "messages"
put "Shake Ended" into line 2 of field "messages"
put "Shake Lasted" && the milliseconds - sStartTime && "milliseconds" into line 3 of field "messages"
The simulator sends a consistent shake message but you should be able to try out various lengths of shake once you deploy this little app to you phone. 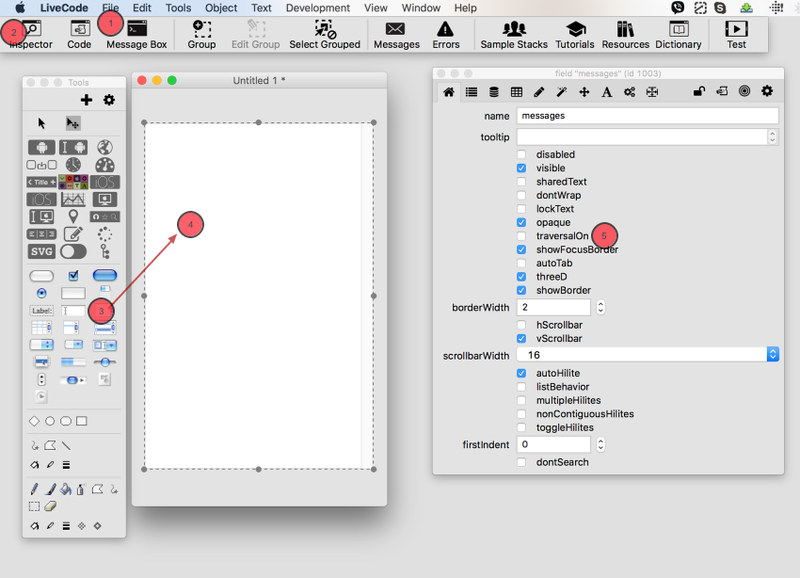 Prev: How do I Capture Images in LiveCode Mobile?